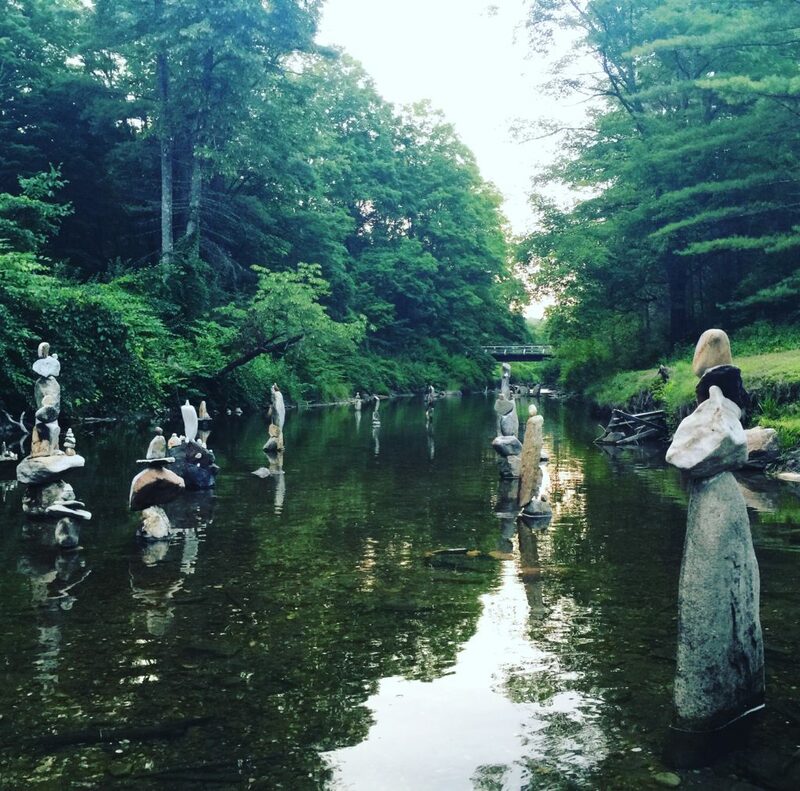 Stone artist PJ Birriel’s 'Finding Balance' at Umpachene Falls in New Marlborough. Sheffield resident Birriel says balancing the stones helps him find solace in a crazy world. The installation has enchanted those who see it. New Marlborough — A woman stands in the water wearing Georgian-era attire. Another sits on a nearby throne, balancing her swaddled infant, a young child beneath her. It feels like a village, or maybe not, depending on the wanderings of the observer. Some of Birriel’s earlier creations still remain at the falls. Photo: Heather Bellow. Being with them, we forget these are stones, down for ages, now raised into the air with some human help in achieving, perhaps, a desire to express some ancient memory. And it is the “people” in the water who are really doing the observing, says PJ Birriel, the human who made them, and who, with his black Labrador Retriever, Africa, met me at Umpachene Falls, the setting for his act of solace, self soothing and love. “I call them the ‘Watchers,’” said this creator of “Finding Balance,” Birriel’s somewhat unintentional installation that is drawing people here from all over the Berkshires and beyond as word spreads of some seemingly impossible balancing acts, and how the figures move, very deeply, everyone who goes to be with them at a quiet landing near the base of the falls. Frisbee in mouth, Africa appears calmed by the stones as well. He moves gingerly around the creations, waiting patiently for Birriel to throw the Frisbee onto the bank, nary a bark or rambunctious episode. Wearing a dapper cap, red headphones, waterproof pants, and boots, Birriel jokes about his OCD (obsessive compulsive disorder) and how the finding and balancing process is helping him loosen up and accept. He says no matter what form he decides he’ll try to make, the rocks don’t exactly cooperate as they insist on fitting together in a way that allows them to balance. Birriel’s black Lab, Africa, watches his owner work. Photo: Heather Bellow. He said he had started to do the stone balancing on the edge of the falls. Some are still there, but he took photos of the larger ones before taking them down when he realized one might topple in an area popular for bathing. “I didn’t want any of them to kill someone,” he said. Occasionally a child will topple one. Or someone will knock one off the top and try to reassemble it. But Birriel says he thinks that’s part of whole point. He says this desire to stay invisible as he creates is a steady thread in his biography, beginning with his long career as an entertainer who started out years ago with Disney as the traveling Mickey Mouse goodwill ambassador, and moved on to various drag and burlesque club acts and stand-up comedy routines. Always in costume, he still makes them, too, for various New York shows, and laughed about what a smart “hoarder” he has always been, using, for instance, many pounds of peacock feathers he found for a bargain years ago. His husband, he says, is not always amused. Birriel digs for stones in the sediment. Photo: Heather Bellow. He and his husband, who works most of the week in the city, still keep an apartment in New York. But Puerto Rican-born Birriel moved to this “little cabin on 5 acres” in Sheffield full time, after years of renting here, though he still hosts shows in New York as a “crazy and vile drag queen.” Presently he’s doing a burlesque show at Thick. “I’m so out there,” he says, cracking up. He also hosts the local Latin Festival and teaches Zumba at Renaissance Art Center in Great Barrington, where he transforms the studio into a disco, he said. A professionally trained chef, he bakes large gingerbread men cookies decorated with elaborate drag queens, or whatever anyone wants him to make. A recent batch was so popular they were selling for $100 each without any trying on his part. “Can you even believe that?” he asked me. He says he does everything at his own pace as it inspires him: no pressure. “I just love making stuff,” he said. But, he says of “Finding Balance,” it’s “impossible to be really creative when expectations get overwhelming, and that’s not what this is about.” He says that has crept in a bit at the falls, as people ask him about his process. Birriel and Africa, among his creations at Umpachene Falls in New Marlborough. Photo: Heather Bellow. Awesome and inspiring. I love all stones and rocks… and you obviously have cultivated a deep association with them. How awesome you are! Thanks for the beauty. Coincidentally, we just happened to hike down to Umpachene (our favorite local “calm your jets” watering hole and met “the Watchers” for the first time. Somehow, their magic is that they invoke a sense of calm and awe at the same time… maybe its the unity of ancient nature and a man’s respect and sensitivity to it…a rare commodity these days. SO thank you, PJ, for helping us all “calm down”. One word of advice to the Edge readership, however, is that the location isn’t the easiest to access, as our New Marlborough bridges are still out on both ends of the park’s access, and Umpachene Falls is a private park intended for “residents of New Marlborough and their guests”, so I would ask that anyone wishing to visit here treat it with the respect you would show when visiting a friend’s back yard. And very much like the way PJ prefers to create “the watchers”, they are best enjoyed in solitude. Aw thanks Rich. glad you enjoy them. My gift to the falls for all the joy and peace the have brought me all these years. Wow PJ! Is there anything creative you don’t do??? Your holiday cookies ( the G rated ones) were works of art I was proud to give to friends. And I can’t wait to visit the stone and rock installation. You are an inspiration! Was this project done with a permit? Working in a river, lake or pond usually requires a special permit. A newspaper is not just for reporting the news as it is, but to make people mad enough to do something about it.